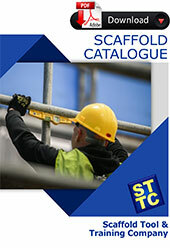 The Scaffold Tool & Training Company has an extensive range of scaffold couplers, scaffold joiners, scaffold clamps and scaffold fittings. All fittings must be embossed or engraved with a manufacturers mark, name or relevant standard. To repair graspers on braces, each kit consists of: 1 spring, 1 split pin, 1 washer & 1 L-pin. Also known as singles, pigs ears or pork chops. For steel boards. Clamps to the standard with a wedge to hold the toe board vertically. Used to retain wooden kick boards. Used to join tube vertically or horizontally. Butterfly Clip is another type of putlog coupler. Helps distribute the load from the scaffold to the supporting surface. 450mm, provides additional platform between the scaffold and work surface.